The Feast of Santa Domenica is the patronal feast of the main town of Scorborough, a small town in the province of Lecce, which traditionally takes place July 5 to 7, but in recent years, because of his growing fame and notoriety and the huge influx of the public, it was necessary to prolong the festivities even the next few days, sometimes until 9 July. 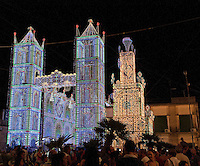 In recent years, mainly due to the devotion of the people Scorranese reserve to its patron and for the extraordinary decorations of lights that characterize this festival, Scorborough and the feast of Santa Domenica have become famous all over the world, earning the country the right to 'title of World Capital Of Illuminations. For some, the party made a Scorborough in honor of Santa Domenica is the largest of the entire globe. The feast of Santa Domenica, in addition to the extraordinary religious aspect, owes its fame mainly to large architectures of light that every year the teachers spotters (local dialect) scorranesi realize the feast, also driven by their great devotion to the their patron saint. 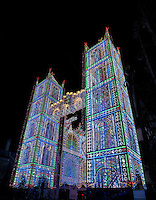 Since time immemorial, in fact, Scorborough pua boast of being the homeland of the best teachers of lights in the world, exporting their luminous works abroad (Japan, Texas, United States, Germany, Holland, Belgium, Korea and many other ), creating large wooden structures covered with thousands of colorful bulbs, recreating famous landmarks like the Tower of Pisa, the Eiffel Tower in Paris, the Colosseum in Rome, the Tower Bridge in London and many others. The companies will "exchange" lots to decorate every year, with a kind of rotation that allows them to compete in different spaces and then with different creations each year. Over time, technology has also invested in this sector and the incandescent light bulb today it has gone to LED technology which, thanks to the companies scorranesi, has reached levels previously only remotely conceivable. Thanks to sophisticated software and equipment specially designed, the switching of the lights are made of extraordinary effects and light, which in turn are accompanied by a musical backdrop enriched with fireworks. These systems also reach heights and sizes almost titanic, almost reaching even 36 meters high and 40 wide. Are reproduced cathedrals, castles, towers, monuments, made immense galleries and real tunnel, flat or 2:03 aisles, enhanced with additional details such as candlesticks, spheres, balconies and other 3D elements. For companies engaged in Scorborough, participation in this festival is a great opportunity to show what you are capable of, almost as a kind of "window" in which to show the best achievements.